Here's a great way to ring in the holidays: Participate in the Barnes & Noble gift wrapping fundraiser that benefits our Angel Fund. RASKC volunteers wrap gifts for customers at Barnes and Noble stores in Tukwila and Federal Way, as we've done for several years. The customers often contribute money to our Angel Fund, which pays for the extraordinary medical expenses for some of our animals. Last year we raised close to $1,000. If you might like to help wrap gifts, please contact RASKC B&N Lead Volunteer Jini Allen to see which shifts are available. Thanks to all volunteers who are signed up already and those who worked these shifts in previous years. RASKC will also be wrapping gifts at Reber Ranch this year for the first time pm Sunday, December 10. 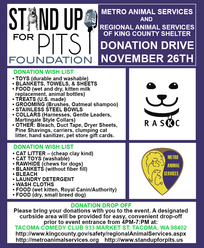 The Stand Up for Pits Foundation is sponsoring a donation drive with curbside drop off at the Tacoma Comedy Club on Sunday, Nov 26, from 4-7pm. If you come inside there's a silent auction and a comedy show ($40- $100, adults only). Thanks to volunteer Melissa Blake who worked in the freezing cold at this event last year and has agreed to do so again this year! The Stand Up for Pits Foundation is a national group that organizes similar events throughout the country to benefit local organizations who help pit bull terriers. Some national celebrities who have been featured at their comedy events include Janeane Garofalo, Tig Notaro, Rosie O'Donnell, Adam Sandler, and David Spade. Thanks to RASKC volunteer Shannon Weiler, who has been making ornaments featuring the photos of RASKC animals to place on the holiday tree at Mud Bay Kent. Customers are encouraged to purchase items to donate to RASKC. Shannon also picks up the donated items and transports them to RASKC. Last year and previous years RASKC received so many donations! Kirkland Petco will be offering photographs with Santa for a suggested donation of $9.95 each from 1pm-4pm on the first three Saturdays in December. With RASKC volunteers assisting at the photo sessions, we will receive $200 plus the proceeds from the photographs. 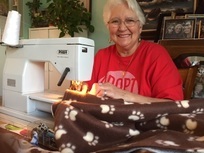 RASKC volunteers Lara and Shawn Steele are hosting another cat blanket-making party extravaganza this year in their home in Bellevue between 10am-4pm during the Dec 2nd weekend. Sign up for one or more of the timeslots. It's important to sign up, so that we don't have too many people at any given time. It's okay to bring family or friends, so long as you note that when you sign up online. You bring the fleece material, scissors, and maybe some holiday goodies. The Steele family will provide festive beverages and assistance, if needed, in making the blankets. Sewing is not necessary, since the material can be cut and tied to make the cozy blankets. If you can sew if you'd like to bring. You may bring your sewing machine or use one of Lara's. She offers to teach adults and older teens how to sew. When Lara and Shawn hosted this event in 2015, over 375 blankets were made. Thank you, Lara and Shawn! If your shift falls on a "working" holiday, it's okay to be absent, so long as you take yourself off the calendar with as much advance notice as possible. 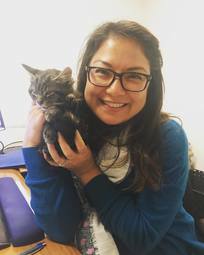 Petco Stores and Reber Ranch: There are no volunteer shifts on Thanksgiving or Christmas if you volunteer on cat-care teams at Reber Ranch or at a Petco in Covington, Kirkland, or Tukwila. Shifts do occur on Christmas Eve, New Year's Eve, New Year's Day, and the Dr. Martin Luther King (MLK) Jr. holiday. RASKC/ Kent Cats: Early Morning Cat Crew works every day of every year. 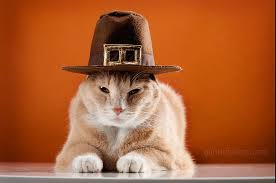 For Cat Meet and Greet, however, there are no shifts on Thanksgiving, the day after Thanksgiving, Christmas, New Year's Day, and the MLK holiday. Regular shifts occur on Christmas Eve and New Year's Eve. RASKC/ Kent Dogs: Morning shifts to care for the dogs take place every day of every year. On Thanksgiving and Christmas, the shifts conclude at 12pm. On these holidays- day after Thanksgiving, New Year's Day, and the MLK holiday- there are also special 2-4pm fill-in shifts, with the dogs tucked in for the night at 4pm. Regular shifts occur on Christmas Eve and New Year's Eve. RASKC/ Kent Vet Clinic: There are no volunteer shifts and no routine foster work at the Vet Clinic on Thanksgiving, the day after Thanksgiving, Christmas, New Year's Day, and the MLK holiday. Shifts do occur and vet services for foster animals are available on Christmas Eve and New Year's Eve during regular hours. RASKC/ Kent Shelter Helper: Morning shifts take place every day of every year. On Thanksgiving and Christmas, the shifts conclude at 12pm. On these holidays- day after Thanksgiving, New Year's Day, and the MLK holiday- the shifts conclude at 4pm. 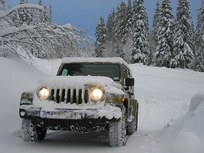 When the weather gets frightening, you do not have to take any risks to go to your volunteer shift. No one is expected to drive on icy roads. RASKC does ask that you take yourself off the schedule and/or contact your team's scheduler if you need to take off a snow day. Several hardy volunteers and staff will make their way in to care for the animals and cover other key work. Meet Cheryl! She is one of RASKC’s most prolific foster volunteers, having contributed close to 1,000 hours or more for each of the past several years. Cheryl has engaged in many different roles since she started in 2008, including Dog Walker, Early Morning Cat Care, and Special Events. Earlier this year, Cheryl also volunteered on many shifts for RASKC pet visits at a local retirement home. An interview with Cheryl can be found on the RASKC website and blog.Thank you, Cheryl! 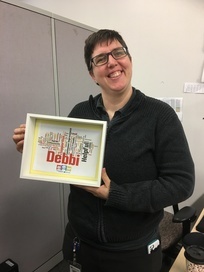 Many volunteers and staff send fondest farewells to Debbi Linebarger, who was recently promoted to be a licensing inspector for King County. Debbi was one of the most helpful staff members at RASKC, especially on matters pertaining to computers, printers, supplies, and other logistical concerns. She also supervised the Call Center staff. Debbi was RASKC's expert and champion for continuous improvement and LEAN systems. Hurray for Kerri Sheheen, who will be backfilling Debbi's position until it is filled on a permanent basis. RASKC gave a temporary goodbye with flowers and cake earlier this week to Licensed Vet Tech Colleen Wayne, who will be working a special assignment in the county's Medical Examiner's office for six months. We look forward to her return. Lluvia is responsible for the communications strategy and community engagement planning, additionally overseeing the customer service call center and volunteer program. Tell us about yourself I am married to my college sweetheart, have a five year old daughter who is the love of our lives and a darling FeLV kitten (also a love! ), named Manu, that we recently adopted from RASKC. Why did you decide to work to help animals? How could you not? Not only are they defenseless creatures who deserve a voice – to be seen and heard – but also, I was inspired by the tremendous work that RASKC was already doing. What did you do prior to coming to RASKC? I began my career at Expedia as the Community Relations Specialist where I went from organizing small call to actions for local organizations to raising awareness about sustainable tourism with the UN Foundation. I moved to Europe where I worked for a European consultancy, providing expert advice to global associations. I later joined The Conference Board where I was responsible for managing their Corporate Affairs Executive Networking program. My last two years in Europe were spent working for UPS HQ where I was responsible for spearheading the internal communications for L&D. By the time I came back to the US, I was on a mission to find a job where I could take my experiences and put them to practice by making an impact where it counted the most. Working for the County, and specifically RASKC, has been one of the most rewarding ways I have been able to contribute to society. What is the best part about your job? All of it! In my line of work, I have the opportunity to connect and collaborate with all staff, volunteers, community organizations, students, media and private companies. What do you do when you’re not at work? Typically we be found enjoying an easy going weekend spent playing games at home, brunch with the grandparents or dinner with friends. Please share a story about an experience with a great volunteer(s) Here’s a few memorable moments that stand out where I’ve had the chance to work alongside volunteers: KinderTours for Cascade Elementary, brainstorming sessions with the dog team, Farrington Court "Senior for Senior" visits, "Family Day" Saturday sessions at Meowtropolitan, photoshoots at Zulily, photoshoot by Delpozzi photographers at the shelter. Nala is 10 years old, a Dilute Tortie (ID #A532401). 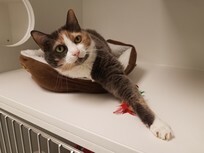 This sweet girl is a spirited cat with a fun-loving personality! She is so affectionate that she rubs all over the hands of those who pet her. Nala sometimes shows some "cattitude" due to the small space she is in, but is really a precious girl waiting for her forever home. She would love a new home with lots of room to explore and play. Nala's $30 adoption fee includes her being spayed, current on vaccinations, and micro chipped. It also includes a free office visit to the veterinarian of your choice and 30 days of pet insurance through Trupanion. RASKC features a new Pet of the Week on our website. 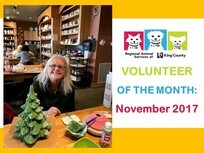 Several suburban newspapers also highlight RASKC’s Pet of the Week thanks usually to the work of volunteer Dawn Gerken. RASKC’s previous Pets of the Week can be viewed on our blog. Volunteer Elizabeth Blake's dog won the best-costume contest as an elf at Reber Ranch's Halloween event last month. Hurray to the NW Pugs Meet Up Group, who raised almost $200 and contributed many items for our animals this month. Hats off to event organizer Toni Fields and to RASKC volunteer Amanda Eagan. RASKC reaches out to international students at Green River College. Thanks to RASKC volunteers Victoria Andrews, Jayne Roddy, and Mike Gunderson for staffing our booth earlier this month at an event focused on international students. Visit animal shelters in Ireland. Humane College is offering its third annual tour of animal shelters in Ireland from Feb 24- March 4. Check the Cat Cozy Blankets: Please ensure that the fringe is very tightly tied. Also check that no stray threads are hanging loose. We do not want our cats to ingest any part of the blankets. Emergency Exit in the Cat Adoptions Building: If you spend time in the Cat Adoptions Building, please make sure you know where the emergency exit is - in the rabbit room, on the other side of the larger cat-colony room. 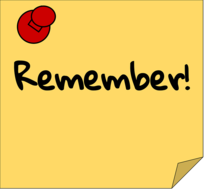 Two Weeks' Notice is almost always needed if you will be making an ongoing change in your shift schedule- to another day, or to switch to alternating weeks, or to go on a Leave of Absence, or to resign. RASKC maintains more than 300 scheduled shifts; 85% are weekly. If you do not see an opening that matches your availability, please be patient. Additional openings occur almost every week! 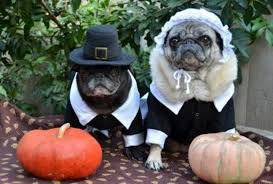 Wishing you & yours a wonderful Thanksgiving! 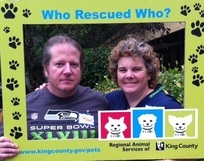 Thanks for all that you do to help the animals, other volunteers, customers, and RASKC staff!